Each player plays one Spirit; the Invaders and Dahan act according to game mechanics. Spirits affect the world with Powers. Each turn, all players simultaneously choose what Powers to use. Some Powers will resolve before the Invaders act, others afterwards. Spirits start with limited options, but can slowly learn new Powers over the course of the game. 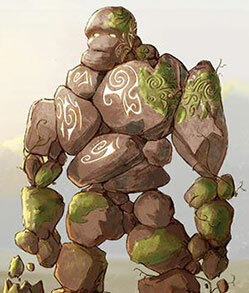 The Invaders will spread across the land, destroying Spirit Presence and Dahan, and Blighting the land. You will not be able to contain them forever. To start, Victory can only be had by obliterating all of the Invaders (difficult!). But as you frighten the Invaders, easier victories will become possible. The game ends immediately in Defeat if no more Blight is left in the Blight pool, if any player is knocked out of the game (by losing all Presence from the board), or if you take too long to rout the Invaders. Power Cards: 36 Minor Powers; 22 Major Powers; 16 Unique Powers (4 per spirit). 15 Invader Cards (in 3 groups). 4 "Single turn effect" tokens. Each of steps #2-4 can be done by a separate player to speed setup. Unless playing a Teaching Game, choose an Adversary and/or Scenario. Place the Invader board on one side of the play area. Put 4 Fear Markers per player into the Fear Pool. Shuffle the Fear cards and put 9 onto the Fear Deck space. Place the "Terror Level 3" divider goes 3 cards from the bottom and the "Terror Level 2" divider 3 cards above that. (So the deck is divided into 3 groups of 3 cards each). Make the Invader deck (see below) and put it on the Invader board. Take a Blight Card and put it out, "Healthy" side up, without looking at the back. (If you are playing a Teaching Game, use the "FIRST GAME" Blight Card). Put the shown amount of Blight onto the card. Mix up the cards from each Stage and choose without looking at them, putting unused cards back in the box. There are 4 / 5 / 6 cards for Stage I / II / III, so you can just remove one of each. Place one Island board per player in the center of the table to form the island. (See diagram at right). Each player starts on a different board. 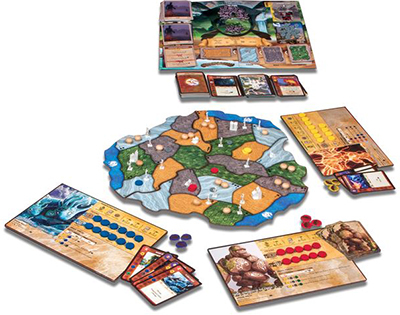 Populate the Island boards with Invaders and Dahan as indicated by the icons in each land. Shuffle the Minor & Major Power decks. Put them someplace on the table where there's room for each to have a discard pile. Put the Energy tokens, Cities, Towns, and Explorers near the board. Make sure all players can reach them; you may need to split them into two piles. Put the Dahan (huts) near the board. They don't need to be accessed as frequently. Each player takes a color of pieces, and chooses a Spirit by taking a Spirit Mat and its four Unique Power Cards (starting hand). For a teaching game: give each player the Power Progression card for their spirit, and the Minor and Major Powers from that Power Progression. (They're marked in the corners for easy identification). Players follow setup instructions on the back of their Spirit Mat. This always includes putting Pres- ence (round discs) into one or more lands on their starting board; some spirits have additional instructions. Players then flip their Spirit Mats to the front and place all remaining Presence onto onto the dashed circles. Reveal the top card of the Invader Deck. The Invaders Explore in that terrain (see p. 13). Then place the card face-up under "Build". 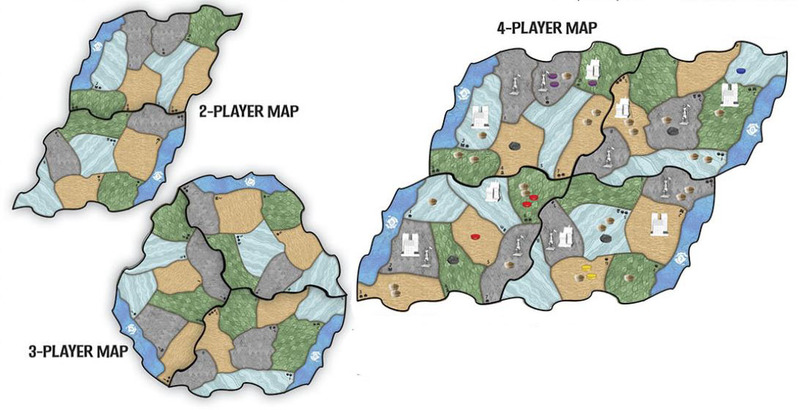 Players play simultaneously within each phase, conferring as they wish. Table talk is not just allowed, it 's likely necessary for victory! Grow: Choose one option (unless stated otherwise) next to Growth at the upper-right of the Spirit Panel. Each section is a single choice. You must do everything shown, but may choose the order. Gain Energy: Gain an amount of Energy equal to the highest uncovered number on your Energy Presence Track. Place any gained Energy on or near your Spirit Panel. Play and Pay for Power Cards: Select the Power Cards (Fast and Slow) that you will use this turn. The maximum number of Power Cards you can play each turn is the highest uncovered number on the Card Plays Presence Track (even if you have enough Energy to pay for more). You must immediately pay Energy for all Power Cards played, even Slow ones. Likewise, you immediately gain all Elements from played Power Cards, even if the Powers effects are Slow. Do not resolve the effects of the Power Cards yet. Some Spirits are inclined to take a long time I choosing Power Cards: perhaps several centuries in I the case of slow-moving earth Spirits. But the threat of the Invaders forbids the luxury of infinite time. Any player may place a limit on the time available to complete the Spirit Phase. This can be done using timer, setting a condition ('When I get back, we start '), or any other means desired. Of course, as this is a cooperative game, it behooves you to not be too draconian. Players resolve Fast Powers - both Innate Powers printed on their Spirit Panel and Power Cards they played. Power resolution can be done mostly simultaneously. When timing becomes important, Powers may be resolved in whatever order the players want, so long as no Power interrupts another partway through. If a player discovers they do not want to use a Power s text effect (or cannot use it), they may choose to skip it entirely. Sometimes, a Power Card will be worth playing purely for its Elements. You cannot delay using a Fast Power until the Slow Phase, even if you want to. Use it now or forego it. Example: Player I uses their Fast Power to target a land without Blight where they have Presence (because the range is 0) and Gathers I Explorer from an adjacent land into it. Player 2 then uses their Fast Power to target the same land and Gathers 1 Dahan into it. Player 2 now destroys the Explorer Player I previously Gathered into the land with the Dahan they just Gathered into the land. When the game calls for a decision (where Blight cascades to, which Invaders to do Damage to, etc) and it s not specified who makes it, what do you do? If the decision springs from a Power, the Spirit using the Power makes the decision. For other situations, players should try to come to a l consensus. For decisions about/within a land: Each Spirit makes choices regarding the lands on their starting board. For other cases: The game owner/organizer makes the call. If the Blight Card has flipped to Blighted Island", follow the instructions there. If you have trouble remembering to do this, put a Blight from the box onto the Fear Space as a reminder. If any Fear Cards have been earned pick up the whole face- down stack, flip it over and resolve the cards one at a time in the order they were earned. Then discard them to the Fear Discard Space on the board. Use only the effect listed next to the current Terror Level. This could be higher than when the card was earned. Fear effects last only for the current turn. Most Fear effects do not cause more Fear. They remove Invaders rather than Damaging or destroying them. However, there are exceptions. If you do earn a new Fear Card this way, put it at the bottom of the stack of cards you're currently resolving. The Invader Board has three Action Spaces: Ravage, Build, and Explore. The Invader Card in an Action Space determines which lands will be affected by that Action. (If there is no Invader Card in a space, no action is taken). Look at the Invader Card in the Ravage Action Space on the Invader Board (if any): the Invaders Ravage in each land of the shown type only. First, Invaders deal Damage to the land and Dahan. Then, any surviving Dahan fight back. Wherever there are Invaders in the shown lands, Invaders deal Damage: 1 per Explorer, 2 per Town, and 3 per City. Damage is done both to the land and Dahan. Invaders Damage the Land: If 2 or more Damage is dealt, add a Blight to the land. (See sidebar). This only happens once, no matter how much Damage is dealt. Partial Damage to the land is ignored. Invaders Fight the Dahan: Every 2 points of Damage destroys one Dahan. You must destroy Dahan as efficiently as possible; you cannot disperse Damage among multiple Dahan to avaoid killing them. If a Dahan is dealt 1 Damage, turn it over to show that it is Damaged. Any surviving Damaged Dahan will recover at the end of the turn. After Invader Damage has been fully resolved in a land, any surviving Dahan there fight back. Each Dahan deals 2 Damage to the Invaders. The Dahan will fight back even if the Ravaging Invaders deal no Damage (for example, due to Defend Powers), but not if the Ravage Action has been skipped or stopped from happening altogether. Cascading: Whenever you add Blight to a land, if that land already has Blight, you must also add a Blight to one adjacent land. (If that adjacent land also already has Blight, it cascades again from there, and so forth). Presence: Adding Blight to a land destroys one Presence from each Spirit in that land. Remember: destroyed Presence is removed from play (set next to the Island), not returned to the Spirit Panels! Spirit Presence does not fight back as Invaders do not directly attack the Spirits. Look at the Invader Card in the Build Action Space on the Invader Board: the Invaders Build in each land of the shown type only. If the land has more Towns than Cities, add a City. (You are not upgrading the Towns, you are adding a new City from the supply). In all other cases, add a Town. Do not Build in lands without Invaders. Ravage, Build, and Explore affect only the land type(s) shown on their cards! Ravage and Build Actions only affect lands that have Invaders! Explore only affects lands adjacent to a source of Invaders! Turn the top card of the Invader Deck face-up. Invaders Explore in accessible lands of the shown type only, venturing forth from Towns and Cities or approaching from the Ocean. If the card has a flag icon and you are playing with an Adversary, first perform the Escalation effect. Most Stage II cards have a flag icon. Its effect depends on your Adversary. If you are playing without an Adversary, ignore the flag icons. Escalation effects happen as soon as the card is revealed, before Explore, unless the Adversary states otherwise. Some may make changes to how the upcoming Explore works. If there is no card to turn up, time has run out and you lose. Is adjacent to a Town, City, or Ocean. No matter how many sources are in or adjacent to an Explored land, you only add one Explorer. Explorers are added directly from the supply, not moved around on the board. After Explore, slide all of the Invader Cards left: Move the Ravage Card to the discard, the Build Card to the Ravage Space, and the Explore Card to the Build Space, so that next turn they will Ravage where they Built this turn and Build where they Explored this turn. 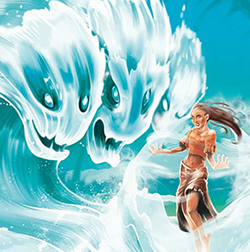 Players resolve Slow Powers, which may be either Innate Powers printed on their Spirit Panel or Power Cards they played. This works just like the Fast Power Phase". This is the wrap-up phase at the end of each turn. Discard: Players discard all Power Cards played this turn into their personal discard piles. Damage and Elements Clear: All Elements go away. All Damage done during the turn goes away; if you turned any pieces on their sides to note partial Damage, turn them back. If you're using the reminder tokens for Single-Turn Effects, make sure to remove those at this time. At the start of the game, the Invaders are at Terror Level 1. 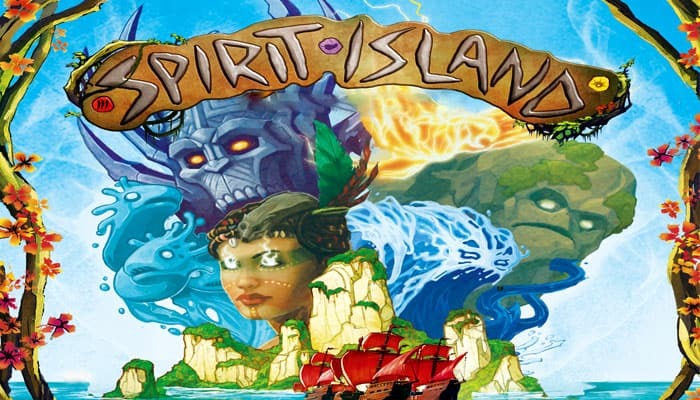 They're not afraid of the island and probably aren't even aware of the Spirits' existence. To win, you need to completely clear the island of Invaders. As you earn Fear Cards (see Fear and Terror, below), you will reach new Terror Levels with easier victory conditions. You win immediately anytime you meet the current victory condition.